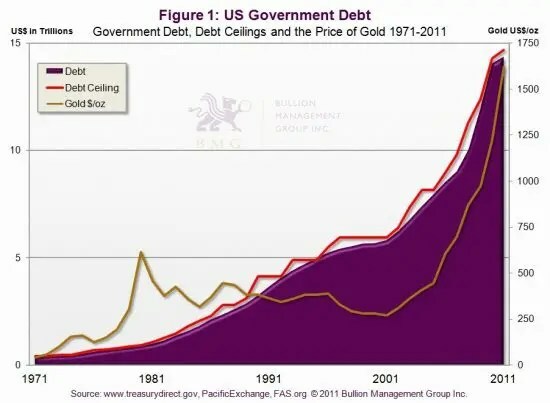 The chart below clearly shows that US federal debt (purple) and the price of gold (gold) are now moving in lockstep. This correlation will likely continue for the foreseeable future. The red line represents the repeatedly violated government debt ceilings. Based on official estimates, America’s debt is projected to reach $23 trillion in 2015 and, if the correlation remains the same, the indicated gold price would be $2,600 per ounce. However, if history is any example, it’s a safe bet that government expenditure estimates will be greatly exceeded, and the gold price will therefore be much higher – and it’s not just the US. Most Western economies have also reached unsustainable levels of debt that will be impossible to pay off. It’s worth noting that the US Federal Reserve, unlike the European Central Bank, can create currency without restriction. The US dollar has been the de facto world reserve currency for over half a century; the rest of the world’s currencies are essentially its derivatives. Whether global debt is in euros or Special Drawing Rights issued by the IMF, the Fed, and thus indirectly the US taxpayer, may become the lender of last resort. Grow out of it through increased productivity and increased exports. This is highly unlikely, as Western economies, and even China, are poised for recession. Introduce strict austerity measures to reduce spending. This has the unwanted short-term effect of increasing unemployment and reducing GDP, resulting in even higher deficits. Default on the debt. This will make it difficult to raise future bond issues. Issue even more debt, and have the central bank in question simply create whatever amount of currency is needed. It’s interesting to note that in almost every recorded case of hyperinflation, the point where inflation exceeded 50 percent a month was caused by governments trying to compensate for slowing growth through full-throttle currency creation. This is exactly what we are seeing today. rising oil prices due to peak oil. increase deficits further and force governments to borrow even greater amounts. credit downgrades result in higher bond yields followed by even greater deficits. This becomes an unstoppable descending spiral. The sovereign wealth funds as well as the more conservative central banks will have little choice but to re-allocate to gold in order to outpace currency depreciation. This is why some central banks, particularly those of China and India, accelerated their gold buying in 2011, for a third year in a row, to nearly 500 tonnes—about one-fifth of annual mine production.While central banks have been net purchasers of gold since 2009, the real game changers will be the pension funds and insurance funds, which at this point hold only 0.3 percent of their vast assets in gold and mining shares. Continuing losses and growing pension deficits will make it mandatory for them to eventually include gold—the one asset class that is negatively correlated to financial assets such as stocks and bonds. When this happens, there will be a massive shift from over $200-trillion of global financial assets to the less than $2 trillion of privately held bullion. 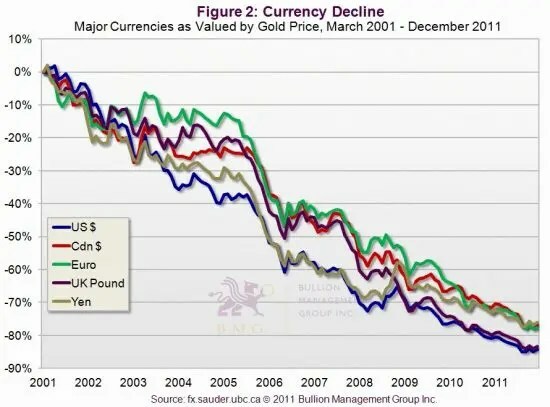 In considering where gold will be at the end of 2012, I looked back to my first Empire Club talk of 2005. I said then that it didn’t really matter whether gold closed the year at $400 or $500 an ounce—the trends were in place to ensure it had much further to rise. Seven years later, we can say the same thing. It doesn’t matter whether gold ends 2012 at $2,000 or $2,500, because gold’s final destination will make today’s price seem insignificant.These can be frightening times, but gold always offers hope. 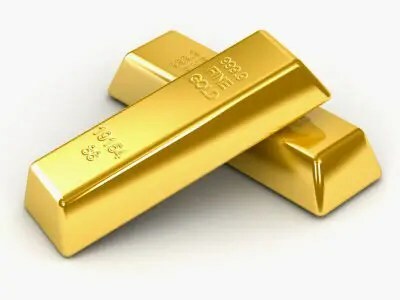 We may not be able to heal the global economic problems of government debt, but individuals can protect and even increase their wealth through gold ownership. Gold bullion ownership, not mining shares, ETFs or other paper proxy forms of ownership, is an insurance policy against accelerating currency debasement. We use the analogy that – In the case of fire, would you rather have a real fire extinguisher or a picture of one? Previous "The Greedy Guru" Wants You!